You may access the new Playlist feature by opening your Account menu. If you do not see the item, try logging out and in again, and if it still does not work, and you are indeed a Toornament Partner, contact us! Once in Your Playlists, you will see a list of all of your playlists, with an option to create a new one, edit any of your existing playlists, or remove one. Be careful, as is, there is no validation on the deletion of a playlist, so make sure not to delete one you don't want to! 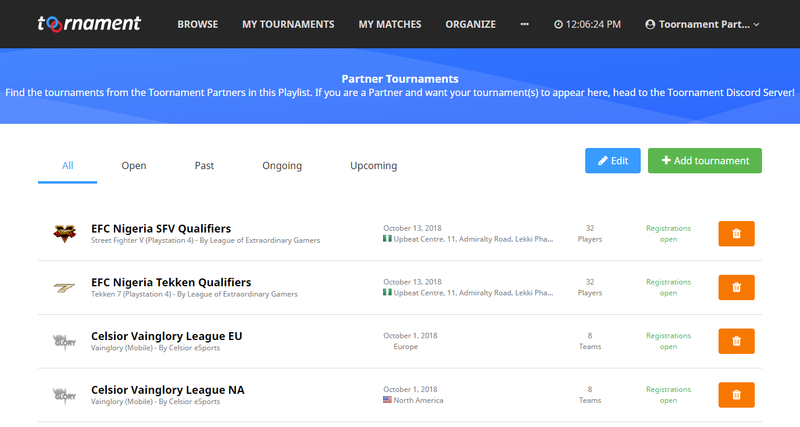 After creating a new playlist, or whenever you want to edit an existing one, you will be brought to the Manage Playlist page, where you will be able to add new tournaments to the playlist, remove some, or edit its information. And you may of course embed it on your website, using the usual iframe codes! This will change the content of the widget to display the same tournaments as you can see in the Playlist tabs, and the filter will be displayed in the top-right blue button, to show which tournaments are being displayed!